Each year REAL Trends, in partnership with The Wall Street Journal, ranks the Top Real Estate Teams, from all companies, in the entire United States, by both number of homes sold and the volume of home prices sold. Because of the amazing efforts of our are agents, staff, vendors, and most importantly, our clients, who trusted us to put the purchase or sale of their largest asset in our hands, we are now ranked as the 15th most productive real estate team in the United States of America! We are extremely grateful for each and every person who has helped us build our business to this point. We look forward to even bigger successes next year. Welcome to the team Amber Toth! Originally a Nursing Major, Amber found her love for Real Estate while working with her pediatric cancer foundation, The Littlest Heroes! 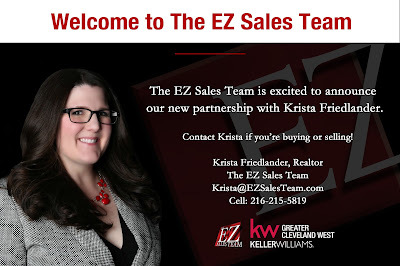 Welcome Krista Friedlander to The EZ Sales Team at Keller Williams Greater Cleveland West! 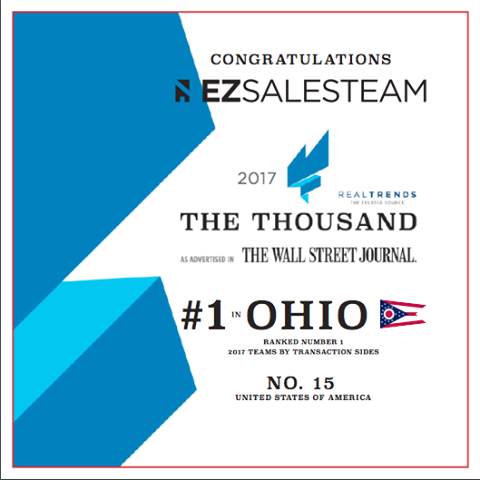 Ohio's #1 Real Estate Team! Welcome to the team Krista Friedlander! Krista is lifelong Ohioan who currently lives in Lakewood, Ohio. When she is not helping her clients find their dream home she is spending time with her husband and 2 children! It's been an exciting Keller Williams Family Reunion Awards Luncheon! We're humbled & honored to be recognized as #3 in Units for Expansion Groups at Keller Williams Realty, Inc. Congrats to all of today's honorees & everyone who worked so hard towards these amazing accomplishments.